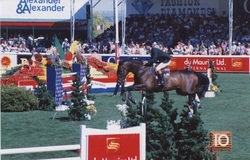 This is voted by many as the top show jumping venue in the world and the Masters Tournament is the richest show of all. Bringing the top riders from all over the world it is host to the richest Nation's Cup and Sunday's $1,500,000 CP International jumping class. Needless to say the competition is the BEST! Equine Studies Canada has decided to include a week at Spruce Meadows as their final hosted experience of the year. With over 500,000 visitors a year and as many as 50,000 a day at the Master's tournament , it is important to book early to secure your seating. Group seating and accommodations will be arranged. This will be a must see for all the newly addicted equine enthusiasts. Full supervision is available for all children. Family entertainment and unique shopping opportunities abound for the duration of the show. This year the RCMP Musical ride is part of the entertainment provided at the Show. Family rates available for the tour. There has been a problem with getting proper security for the form below so we have built it onto a different site with a secure web page and forms. Click the button to go there. Both these options are unique to this part of the world and it may be well worth your while extending your stay to see more of Alberta. Please let us know if you wish an extended stay. If you indicate that you wish to use some other form of payment , we will see whether we can process this for you.